I can’t really adequately say everything I am thinking right now, and I’m not even going to try. I had a really great weekend, had several very good sessions at the worship conference, and had a lot of fun as well. But the pinnacle of the trip was definitely today, thanks to Mars Hill Church (and the Kalamazoo Air Zoo). I was just so amazed by this church–a mega-church that isn’t like any other mega-churches. They don’t have a fancy building, a big production or any of the razzle-dazzle we associate with churches like Willow Creek. Their church is the majority of a strip mall that they’ve turned into a church. The sanctuary is big and open, with simply the rafters overhead and plain green walls on the outside. It’s setup in arena format, so the stage is in the center with seats on all sides. After a long weekend of worship conference, I walked in to Mars Hill expecting a lot of flash and bang, and what I got instead was incredibly stunning. My experience actually started about a quarter mile away, when I met a huge traffic backup all the way from the church, up the offramp to the shoulder of the highway. I guess I didn’t need those directions to the church after all. From the exit, it took me twenty minutes to get to the church (which I could see the whole time.. it was right there on the other side of the interstate). Then I got in and walked right into a packed-out 4000 seat sanctuary. Everyone was standing and worshiping… to hymns being played in a very distinct hoedown/bluegrass style. Lyrics were displayed over the stage in plain black backgrounds with white letters. There were no special lighting tricks or other emotional grabbers; in fact, the only technological masterpiece there was the sound system, which was immaculate and incredibly perfect for what can in no way be an easy space to amplify. 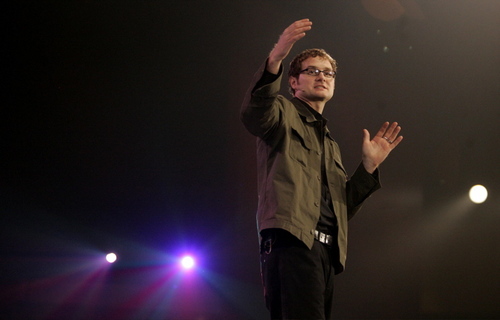 After the great worship, Rob Bell got up on stage. But he didn’t get up and start preaching right away. He started giving announcements. Announcements!? I thought the boomers had completely eliminated these babies! Nope, not only did he give them, but they were almost ten minutes long. He started by telling how there would be a members meeting afterwards to amend the church constitution, then invited the children’s ministry director up to speak. She got up and addressed the need for volunteers in the children’s ministry–then asked for 293 people to step forward and help. 293 MORE volunteers. Rob Bell then proceeded to say how he felt about the subject. He told the congregation that the spots needed to be filled, and they needed to be filled now. It’s part of your calling as a Christian and as the body of Christ. Next, he showed us a soccer ball from a Rwandan village. It was made of trash, wrapped together with some pieces of string and yarn. I believe the exact statement went like this: “This is a soccer ball from Rwanda. It’s what the children play with every day. And it’s completely unacceptable.” Apparently part of Mars Hill’s outreach is to a city in Rwanda, where the church has basicaly adopted the entire village. They had taken 1200 orphaned or needy children and began supporting them, and still needed to adopt 100 more. Oh, and the soccer balls? Well, the 5-6 grade ministry felt a burden to send some soccer balls to villages of Rwanda. So the kids themselves began contacting sports organizations, shipping companies, and went door-to-door taking collections. And they raised and donated 1500 soccer balls to send to the country. Wow. We listened to a mostly good sermon by Rob Bell, who is a phenomenally gifted speaker, and then had communion as a church. What? 3500 people had communion? Mega churches don’t do that! This one does. And not in any special way, either. There were centers located throughout the room, and people just got up and took communion when they were ready. The band played a few more songs, and then Pastor Bell got back up to close. He mentioned that there were still 100 children needing adopting, and told the congregation that they would all be taken by the end of the day. He then mentioned that offerings could be given in the joy boxes on the way out the door–and as he mentioned it, a cheer went up from the congregation. People were giving joyfully? No way… it can’t be! Now, I am sure that this church is not perfect. But it does have some striking things about it that most churches just don’t have. For starters, a pastor who is willing to call his congregation out on things when they need to be. Not by preaching a sermon series on topics, but by just getting up in front and saying ‘this needs to be done, and you, as a follower of Christ, need to do it. Now.’ A warm, friendly congregation. People who gave joyously, and not because they had to, but because they wanted to. A church that is reaching out to not only the community, but the world. I had finally convinced myself that I wasn’t called to church ministry–at least not in a traditional sense. And maybe I’m not, it’s something I need to pray more and more about. But one thing I can tell you is this church fired me up this morning. Suddenly I believe that there is actually hope for the church as it is today. And I do know that somewhere deep down inside is a dynamic, engaging, truth-bringing speaker. I’ve just never figured how to bring him out when I actually speak, say, in front of Chorale, when I give very straight-forward, cut and dry devotions. But the possibility is there somewhere. Who knows. And who knows where I’ll feel myself being led in the next year or two? Unfortunately, it’s looking more and more likely like that place is seminary (dangit…). But hey, it’s not really my life, is it? No, morty, it’s not your life. I really need to visit mars hill, I’ve wanted to for a long time, but never got the chance. Maybe I’ll do some more traveling this summer. I’ve always wanted a to hear a pastor get up and tell the people what they should be doing, because that’s what God’s word says…and then preach. It sounds like a great experence, just to hear people cheer about being able to give there offering…I’d love to feel like that eventually. I don’t have much more to say right now, just that I’m glad your posting again. It’s hard to keep track of you and everyone else when no one posts. Great posts to come back on too. I envy you my friend! I would love to have gone with you! I listen to Robby all the time! I think his preaching may be the best in the country. My grandparents went there in the fall or late summer, and they didn’t like it, but I think it had something to do with the genre of music, and the comftorableness of the dress and etc. oh well I love everything i’ve seen and heard. glad you got to go to mars. it is an awsome church. i live in michigans u.p. and have friends that live in grand rapids. love to go down and visit the church. nothing like i have ever experienced. its good to see a church that tries to really live the jesus way. hard to come by now days. what amazzes me about robs ability is he can take something so basic and make it profound. glad he allows god to use him that way. anyway nice site and have fun in seminary.